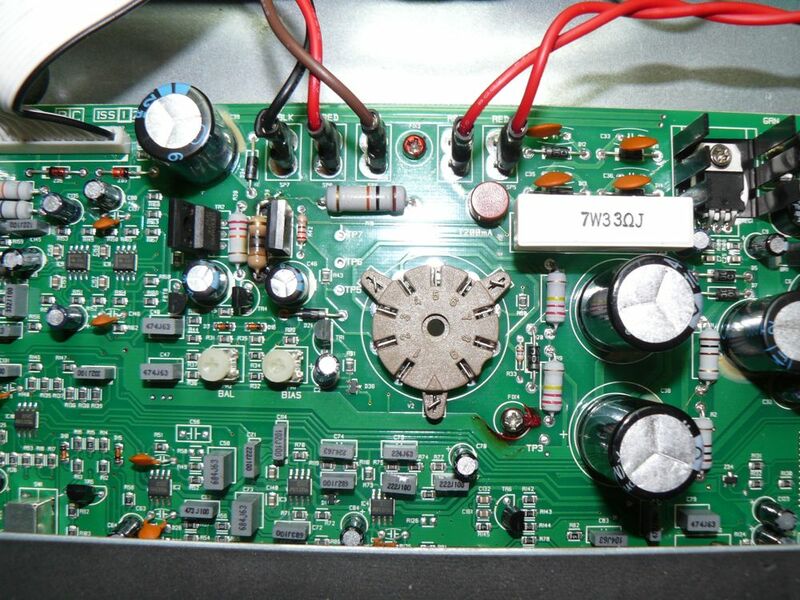 Blackstar HT5 bad sound | It-11 Audio / Tonegeek"
I got this nice little amp to fix. It fizzed. 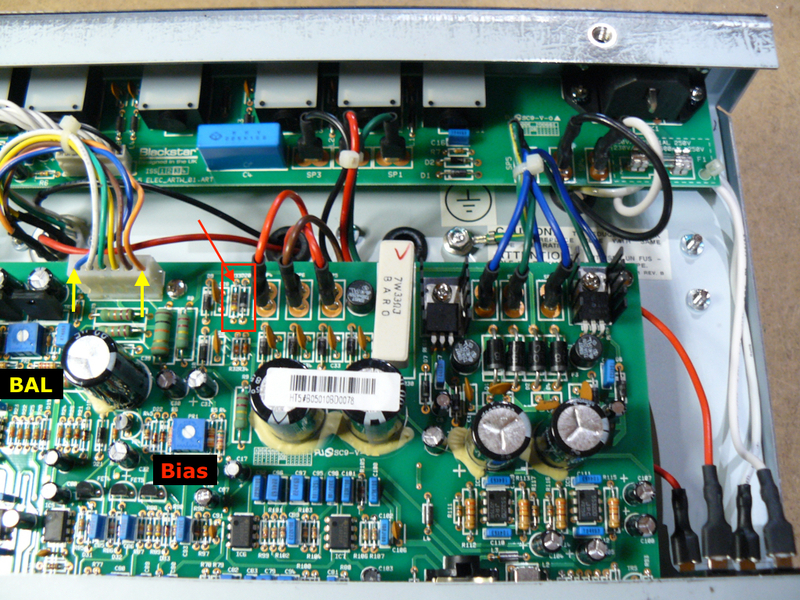 I checked the tube : OK … then I saw R39 resistor was burnt. I spiced the FET PI, replaced the burnt resistor and compare voltage : good ! A few days later, my customer came back : his amp had the same problem, again ! 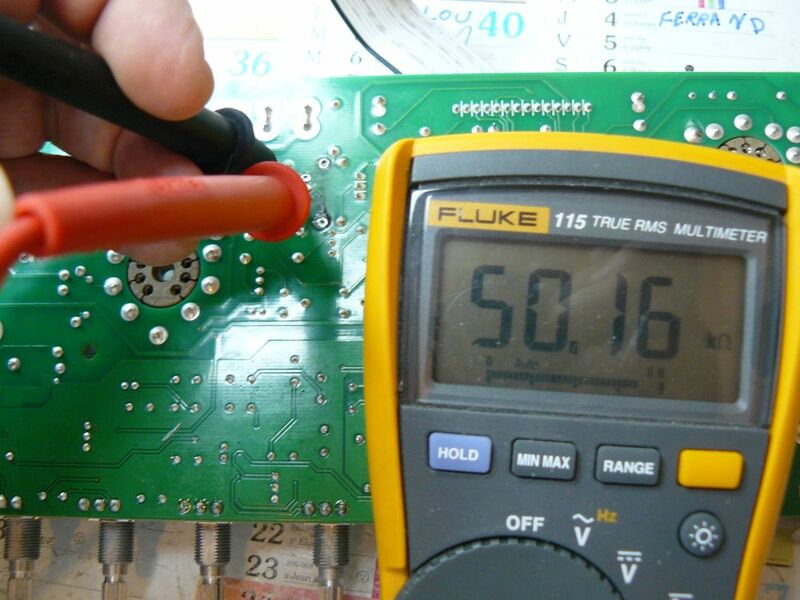 We should get an infinite resistor between Source and Drain holes … and we read 50kΩ ! I removed R38, TR2 and C45 : no short there ! 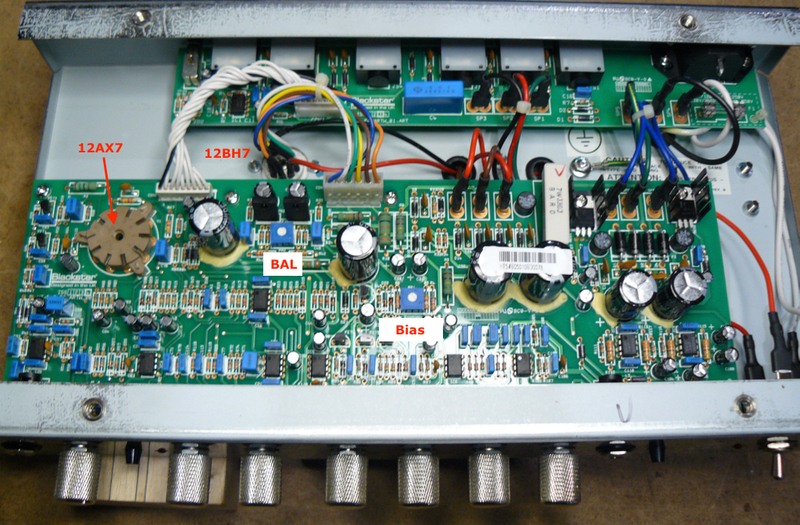 Soldered new 22k resistor, TR3, C46 … amp to the test ! I got another Blackstar HT5 to check. 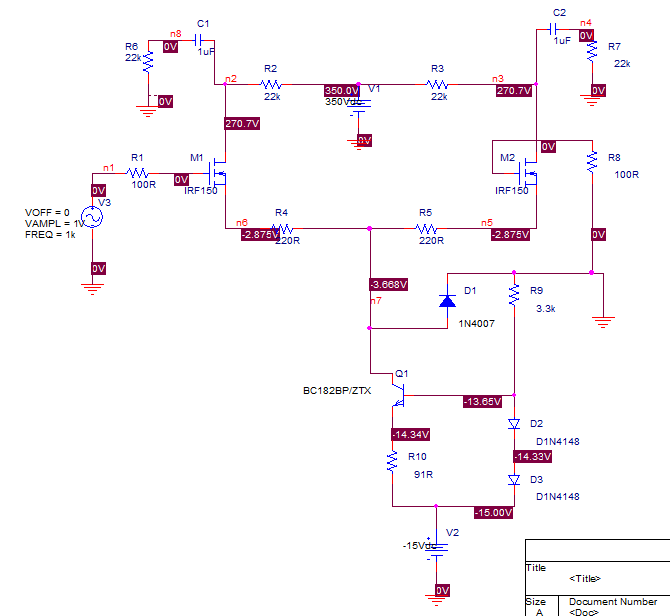 In this one, there is a new designed PCB (I didn’t notice the “R39 bug”) … but how to bias this new version ? To check balance, measure voltage between blue wire and ground, and compare to orange wire and ground (blue and orange wires go to 12BH7 grids 1, triode #1 and triode #2). To bias the amp, measure between R33 (red arrow) and ground (or voltage drop across the resistor R33), you should read 46mV (470V at the anode) : bias PR1 pot ! This entry was posted in Amps. Bookmark the permalink. thank you so much! very helpful! Excellent instructions and photos — thanks. I just fixed an HT-5C with the exact same problem. R39 was very fried and so was the trace to R10. After removing R39/TR3/C46, leakage amount was even higher than you observed, but only between drain and gate. I remedied the PCB leakage via carefully digging “trenches” on either side of board using an exacto knife until measuring no connection. This seemed safer than drilling through, and was effective. 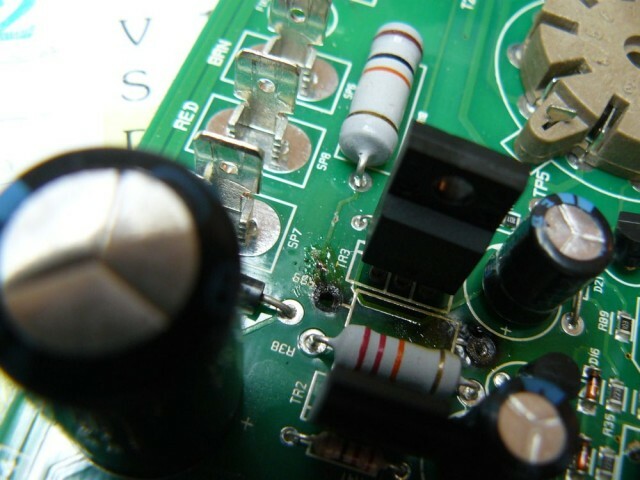 As the board is double-sided as opposed to multi-layer, there is little chance of connection _within_ the substrate. Also I upgraded the R39/R38 pair to from 1W to 2W metal film resistors to get a little extra safety margin. Thanks bobatious for the tip with exacto knife ! Yes, R33 is the 4.7Ω tiny resistor (see picture above, I updated my post). I have a problem, I made the repair you say but I get that voltage at all points of the valve 220v only appear approximately ‘ve measured SP5 and I get at most 350V and 220V SP4 . I have problems with the transformer ???? 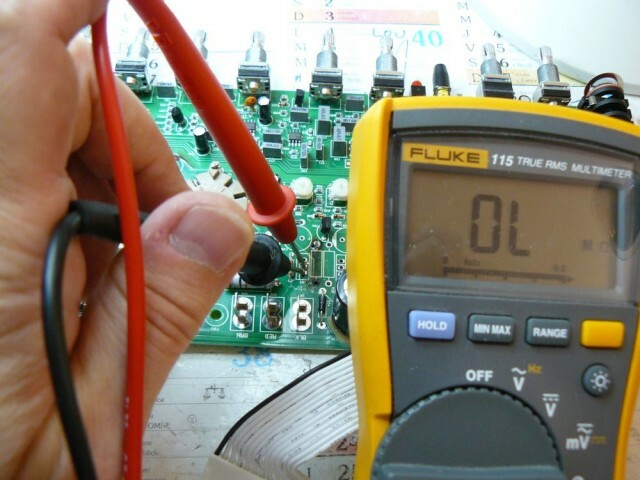 Did you try to unplug the power transformer (secondary) and measure V AC ? Had this one on the bench with the same problem. After reading your post – problem solved! Million thanks!!! Glad to help, Laslo ! Recently, I had to re-read my post as I got another Blackstar HT5 with the same exact bug to fix ! Very nice video, Barry, thank you very much ! Anytime! 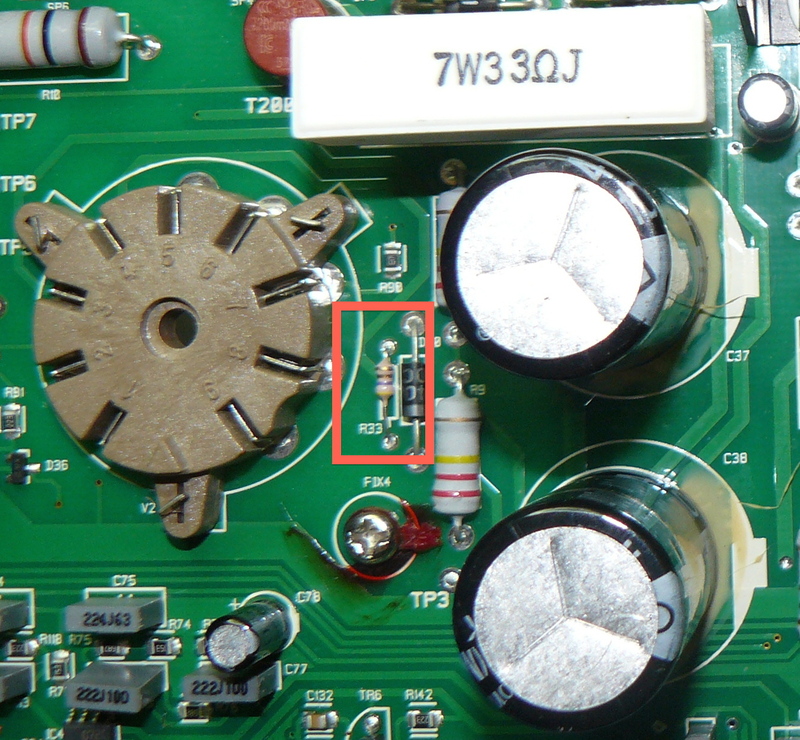 Some other issue can be which is the two capacitors 1uf 450V c45, c46 heating up then causing the MOSFETs tr2&tr3 to distort the signal. Better replacing those with non electrolytic capacitors and new mosfets in that case. I had a Blackstar HT5-5TH with no sound. After much searching, I found that the op amp on the back board, next to the Send/Return jacks, was bad. Signal in from the return jack would not pass through it. I should have known earlier when I found signal coming out the Send jack, but inserting signal into the Return jack did nothing. Thanks for lots of ideas and info on what goes wrong with these amps. I think they are overly-complicated. Thanks for the information, Mike ! I had absolutely same problem. 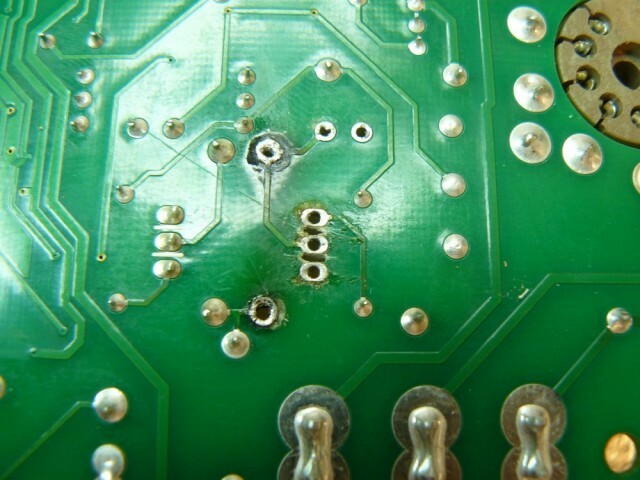 But I lifted S pins of FETs, cut PCB traces and connected them to capacitors with wires. Thanks for the trick, Igor !